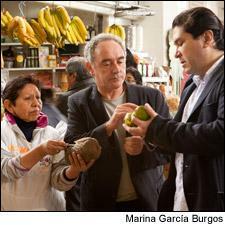 Ferran Adrià (center) and Gastón Acurio (right) explore the riches of Peru's markets in the film. “This is the most important day of my career,” said Ferran Adrià, presenting a new film—Perú Sabe: Cuisine as an agent of social change—in the United Nations Economic and Social Council Chamber in New York on June 11. It was a bold statement from one of the world’s most famous chefs. Adrià, whose El Bulli outside Barcelona was recognized as one of the world’s greatest restaurants before he closed it in 2011, has many significant achievements to his credit. But, he claimed he was most proud of this film and its testimony that the culinary community could have a positive impact on the social and economic conditions of an entire country. The 70-minute documentary follows Adrià as he explores Peru with Gastón Acurio, that country’s top chef, who owns 12 restaurants there and 18 more around the world. Acurio and Adrià travel from the seacoast through mountains and deserts to the Amazon jungle. The film centers on the Pachacútec Culinary School, founded by Acurio in 2007 in a barren desert two hours north of Lima, which prepares students, mostly from poor families, for careers in the hospitality industry. The voyage traces Peru’s culinary culture from farmers and fishermen, through lively markets and restaurants that range from street vendors to stylish temples of avant-garde cuisine. The stories it tells bear heartfelt witness to the many obstacles that face this developing nation but also provide evidence of the amazing wealth of raw materials and culinary cultures that it can draw upon to advance social change. “In such a difficult world, this film is a song of optimism,” added Adrià. Perú Sabe will be broadcast on Univision, another sponsor, later this year; more information is available on its website: www.perusabe.com.pe/en.